I left my Apple Pie Bourbon infusion for a little longer than my Bramblin Infusion, for a total of about three weeks. I would have left it for another week or so, but I’m going on holiday tomorrow and it tastes pretty good now anyway! Interestingly with this infusion, I lost about 50-100ml of finished product compared to the Bourbon I started with (750ml). I’m guessing this was because the apple and cinnamon probably absorbed a fair bit. This is probably worth knowing in case you plan on making this Apple Pie Bourbon infusion for a gift and are expecting a full 750ml back! The finished Apple Pie Bourbon infusion tasted pretty awesome. Of course, I would say that – but it does! When filtering it into its bottle, the kitchen really started to smell of the apples. When you drink it, you’ll find the flavours are reasonably subtle, but the whiskey is certainly slightly sweeter and smoother than it was originally (probably thanks to the natural sugars in the apple and the impact of the vanilla flavour on the overall taste). After bottling a 500ml batch, the remaining ~200ml I put into a mason jar and added ~20ml of sugar syrup. This is super easy to do – just see the recipe below! 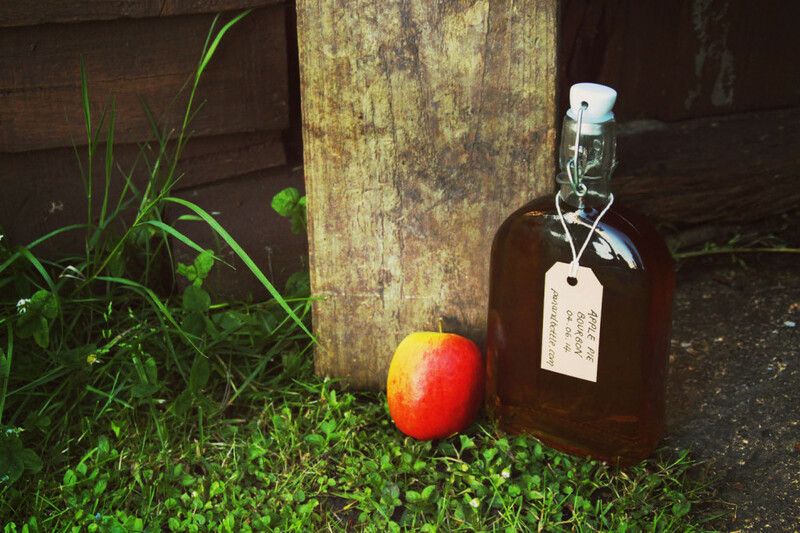 I found by turning it into more of a liqueur, the Apple Pie Bourbon infusion became even more flavoursome – the sugar clearly helping to draw out the fruit flavours. Give it a go and see what you think and let me know how it turns out for you in the comments! A yummy infusion using bourbon and just a few other ingredients. Wash thoroughly and sterilise your mason jars. Wash, core and chop the apples into wedges. Slice the vanilla pod length ways. Add all ingredients to your mason jar. Leave for around three-four weeks, or until you're happy with the flavour. Fancy it a bit sweeter, more like a liqueur as mentioned in the write up? Just put an equal amount of caster sugar and water into a pan, heat gently until the sugar has fully dissolved. Remove from heat, allow to cool slightly and add to the infusion in a ratio of 10 parts infusion to 1 part sugar syrup. I used three 500ml Mason jars for this infusion, as the apples take up quite a fair bit of volume. You could do the same, or just buy a bigger mason jar! Make sure you use enough apples so the bourbon just covers them when poured in. The amount in the recipe is just a guide.